Welcome to this month's Science in Fiction feature! Science in Fiction is a meme I created to showcase the wonderful aspects of science in Young Adult fiction novels. For more information and previous feature, check out the "Science in Fiction" tag! This month, I'm featuring Honor Bound by Rachel Caine and Ann Aguirre! I have not read Honor Bound, but I have read its predecessor, Honor Among Thieves. 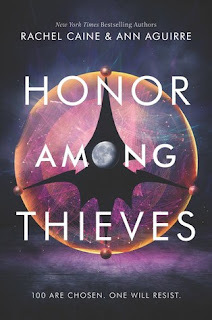 I LOVED Honor Among Thieves, and I'm so excited about its sequel. I mean, who wouldn't want to read about a bada** group of intergalactic fugitives?! There's a lot of space-related fiction out there today, but I want to direct your attention to this series. - Zara is SUPER cool. She is fierce, determined, and can kick some booty. - Nadim is a sentient ship - how cool is it to have a ship as a supporting character?! - This was the first book I read in which the protagonist asked for pronouns. That is neat! - There is no real romance which can be a sad thing for someone like me, but a great thing for those not into romance! - Action! Danger! Threats abound! Anyway, I'm not going to relate Honor Bound to current events since I haven't read the book, but I can push this book (and series in general) on everyone! 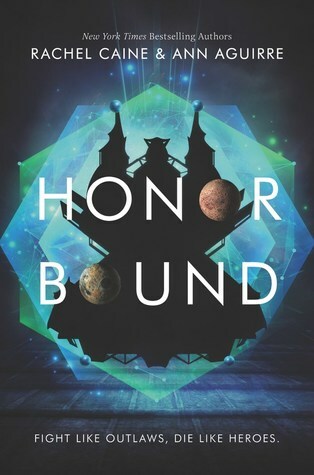 Check out Honor Bound on February 19th! I have been reading more scifi and this does look like a good series. Glad you are loving it.